The Dingle Peninsula is a pretty straightforward region of Ireland. It’s only 30-40 miles long, and as long as you have a sense of direction you’ll get to where you need to go, even without a map. After a half an hour of riding into the town of Dingle and getting used to riding in left-sided traffic, we set our eyes on Slea Head Drive, the premier scenic loop around the western tip of the peninsula. Absorbing the crisp sea air and a late autumn Irish sun we stumbled across empty beaches, backyard castles, and envious policemen. Almost immediately, we realized that riding through a region as opposed to driving through it, connects you way more to the surroundings and is a much more thorough process. On any narrow Irish road, pulling a car off to the side is a near impossibility. Pulling a bicycle off to pet a curious mule on a detour? Way more preferable. While we had certain points we wanted to see and stop at, the amount of times we changed course and wandered were countless. In a car, you’d be done with the entire loop in an hour or two, and the groove of getting in and out of the car between stops, driving to the next one, and getting quick glimpses of the countryside would might as well become a hassle. As we carried on through Slea Head Drive, the cliffside route was certainly building towards something, and after a couple hours of riding, we had naturally found ourselves on the growing side of a hungry stomachs. With convenient timing and more than convenient scenery, we had turned the corner on the northern stretch of the loop, opening up to a gorgeous vista sprinkled with few stone houses, and one “cafe” in particular. Inside were an elderly couple making tea and scones for any travelers passing through. The view from their door was met with indescribable sense of calm and pleasantry. We sat, stress-free and just looked out towards the Blaskets and conversed with a hiking family who also happened to have New Jersey roots nearby to where we grew up. With the late afternoon sun peaking through the rolling clouds, we sat in an awe that it was only day one. 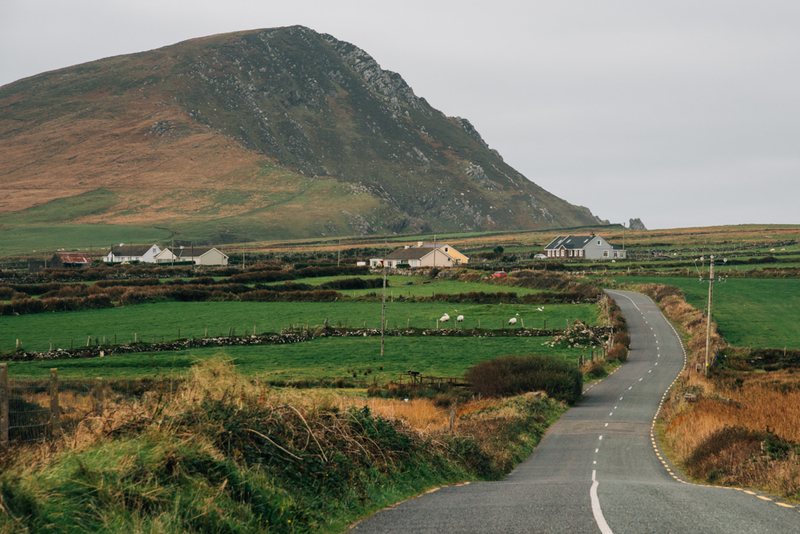 We woke up to moderately sore backsides and after a full Irish breakfast in Dingle, we set a course for the midpoint of Conor Pass - one of only a few major roads that connects the town of Dingle with the rest of the peninsula. We knew going in that we would see how far we could get before our legs would force us to turn back. Obviously for a car, it’s a non-issue and only a 10 minute drive from the center of town. But for a bicycle, two moderately athletic guys, and a long, consistent incline, we knew it was going to be a bit more of a challenge even with the push of the electric batteries attached to our bikes. Like the day before, this sense of calm and relaxation took over as we enjoyed the views and wandered farther up the ridges from the viewpoint. We had no schedule, nowhere to be, and only sunlight to burn. Seeing that we only had a few hours before dusk, and riding down the other side of Conor Pass, only to come back up would have absolutely finished our legs, we decided to take the easy way out and enjoy an effortless ride back down into Dingle for some food and pints to finish the day out. The previous night’s outing didn’t necessarily hinder our energy levels for the the ride we were planning for our third day - it just led to a justifiable sleeping-in. Once underway, our target was Brandon Creek, tucked away underneath Mount Brandon. Even though it’s accessible from Slea Head Drive, there’s only one major road offering a direct route from Dingle itself. Cloud cover and a subtle drop in temperature were a welcomed comfort as well, considering the two previous clear days were a bit of a rarity for the time of year. Immediately, we found ourselves experiencing the quieter atmosphere for this part of Dingle. The whole peninsula can be said to operate on a slower clock, but from Feohanagh to Brandon Creek, we concluded that time might not even exist. The eerie silence only broken by a periodic breeze, cackling crows, and barking farm dogs solidified the soundtrack to our ride (okay I’ll admit, maybe one or two plays of In God’s Country). The peak of Mt Brandon was lost in the clouds, and almost out of nowhere appeared signs for Brandon Creek, the starting location where St. Brendan would sail westward from in the 6th century to arguably set foot on North America long before Christopher Columbus. Marked by a replica of the vessel that would’ve been used by St. Brendan and the 14 monks that accompanied him on the voyage, we explored the area of the now concrete boat launch. While a few people came through for photo ops, there was one that stood out. We had watched this older man, white beard and hair, strip down to his underwear, walk towards the creek, and...jump in...the frigid water. While Mike and I looked at each other in a nervous awe, he took a couple mediative strokes for a few minutes and came back to his car and took a towel to dry off. Striking up conversation, he had told us he lived nearby, and this is his daily routine when he’s home and has been for decades as the water gives his body a wake up. Fittingly enough, he is an irish musician and outdoorsman who recently took part in a rowing journey which was featured in a recent documentary Camino By Sea, where he and others rowed a 6th century type vessel that St. Brendan would’ve rowed, from Ireland to Northern Spain. As the conversation kept on, the history and knowledge he bestowed on us, his legend growing, and when we asked his name....Brendan. Now that we think of it, the resemblance between Brendan and St. Brendan couldn’t have just been “uncanny”. The early-morning train from Mallow to Killarney was just about empty. Dew and condensation had made any sort of view out of the windows just a bit blurry, but clear enough to recognize the Kerry mountains growing in size in the distance as we went westward. With our preparation ready to be tested, we were riding waves of nervousness and confidence. We were attempting to summit the highest peak in Ireland, Carrauntoohil.